Probably my biggest gripe with cryptocurrencies today is that there are some terrible ideas out there with a lot of funding and backers. Many of the ICOs consist of some of the crappiest ideas ever thought of. Literally, a 2 page pdf with some grand ambitions but little when it comes to technical implementation, scalability and marketing are getting funded to the tune of $25 million and up. There are so many terrible ideas on the blockchain that it's laughable. Just as the dot-com bubble had its pets.com debacle, i'm sure ten years from now, many of us will be laughing at these cryptocurrencies that promise to cure cancer and eliminate bank fees at the same time. The software ecosystem that has been built around these cryptocurrencies make the Android Play store seem well regulated. Wallet software is a major culprit. It is hard to trust your life savings to an app that spews so much rubbish and fails half the time. I sure as hell wouldn't put any of my dollars into a bank that had such a terrible online banking experience. Software standards aside, the service providers that are supposed to help you manage your cryptocurrencies and facilitate transactions leave a lot to be desired as well. Naivete and lack of sophistication would be putting it mildly. 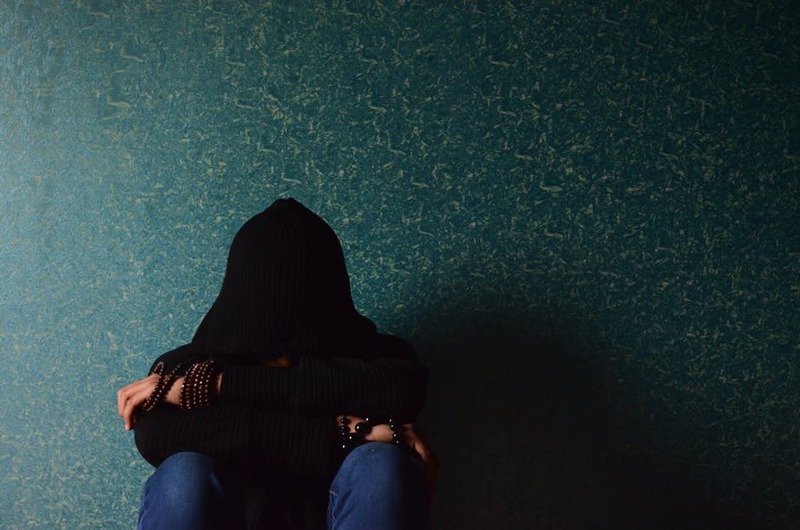 Non-existent customer support and not honoring deposits and withdrawals are all too common in this space. I recently deposited some coins into one of the major exchanges, only to see them "freeze the wallet" an hour later. Hey, i understand that maintenance needs to be done every now and then but this took a ridiculous two weeks! If a bank or remittance service like PayPal had done this, there would be people screaming in the streets and there'd be a full blown investigation. Is there even a demand for cryptocurrencies? Cryptocurrencies like Bitcoin were sold to the public as a tool for anonymity. The truth however is that unless you go to great lengths, buying bitcoin by any convenient means would identify you. Every transaction is also recorded on the blockchain, so as long as they can tie a transaction to you, it is no longer anonymous and there's no way to ever delete it. Sorry to burst your bubble, Pablo Escobar. The real demand for cryptocurrencies is driven by speculators rather than actual users. How many of you have or know someone who has paid for a coffee using litecoin or ripple? The wild price swings are due to what I believe is a lack of liquidity in the market. When a "whale" decides to move his funds elsewhere or take profits, there's a huge collapse in the price. 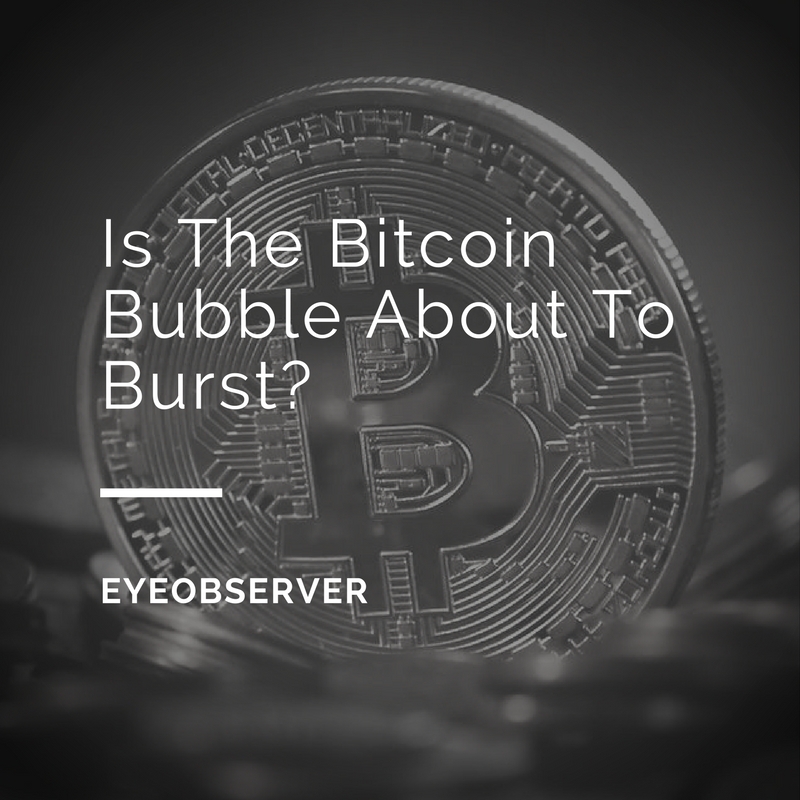 Is the Cryptocurrency bubble about to burst? So there are a number of problems with cryptocurrencies. Is the hype surrounding them about to die down? As Issac Newton famously once said about bubbles and speculation - "I can calculate the motion of heavenly bodies, but not the madness of people.". 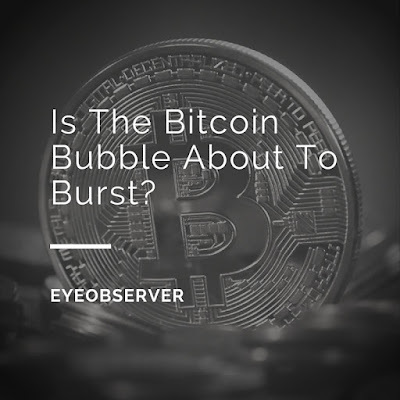 While it is hard to predict with any certainty whether the cryptocurrency boom we have seen this year will continue, i think we're not even close to seeing the bubble pop anytime soon. 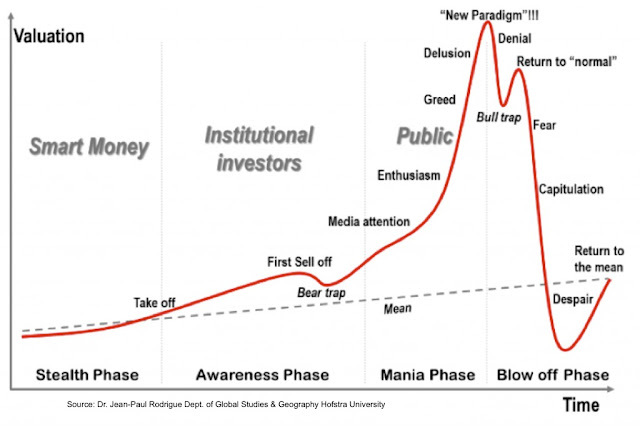 To understand whether the bubble is going to pop anytime soon, we need to place which stage of the bubble we are at. We're definitely not in the "Smart Money" or "Institutional Investor" phase right now. This would have been some time around 2011 to 2014. For an excellent perspective on the early days of bitcoin and who some of the "whales" are, I highly recommend that you read the book Digital Gold by Nathaniel Popper. Bitcoin has now captured the attention of the public, and in my mind, we're somewhere in between the "Media Attention" and "Enthusiasm" phases. There's a new article about bitcoin almost every day in the financial press but the coverage isn't as excessive as it is with equities or like it was at the peak of the dot-com bubble in the 90s. The other reason why i think bitcoin valuations still have a long way to run despite the meteoric rise this year is that compared to other major asset classes, the market capitalization of all cryptocurrencies combined is still rather small. 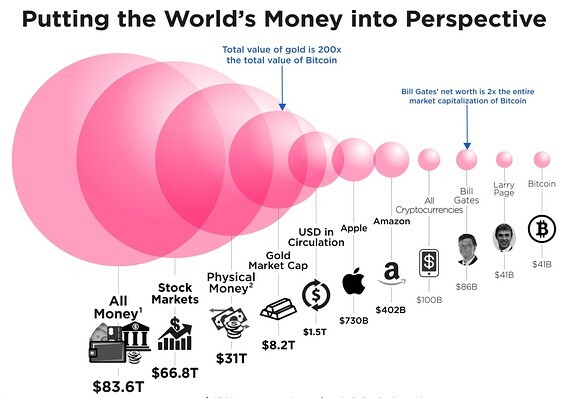 The above chart from howmuch.net is a little dated (bitcoin is now valued at $71 Billion) but it shows nicely how some of the richest men or companies could, in theory at least, buy all of the existing bitcoin on their own. Apple alone is worth about 10 times as much as bitcoin. From reading Manias, Panics, and Crashes: A History of Financial Crises, if there was one thing that stood out to me, it was that all bubbles burst when there are no buyers left to buy. There always comes a day when the buyers no longer show up, and that's what sets off the panic in the market. According to coinmarketcap, the total market capitalization of all cryptocurrencies is only $158 Billion. I'd sit up and take note when the bitcoin market capitalization is greater than the most valuable company in the world. Till then, the party continues. You may be worried that you missed the bitcoin / cryptocurrency boat and to a certain extent, that's true. You're definitely not one of the early investors but does that mean you can't get on the boat anymore? Well, this isn't meant to be investment advice but what i'm personally doing is to buy Bitcoin on dips. I think we could see $10,000 per bitcoin by the end of next year. Someone who is a little more optimistic is John McAfee, who bet his manhood that the price for one bitcoin will hit $500k within three years. Fingers crossed! Thanks for reading! In full disclosure, there are a couple of affiliate links in the article above. We'd like to take this opportunity to thank you for your support all these years. It has really helped us to keep the site going.